As our Pastor was preaching through the book of Hebrews in our Sunday morning services, the subject of animal sacrifices inevitably came up. He made a point that I think is well worth repeating (of course he made more than one point worth repeating, unfortunately I only have time to relate one of them here). But first, a couple comments of my own. In modern day America, cruelty to animals has come to cause of more outrage than aborting babies. While I find that fact both shocking and disgusting, my attitude tends to swing too far the other direction. Because I see the hypocrisy of those who put animal life above human life, I tend to look at the abuse of animals a bit more cavalierly than is proper. As an example, I did not think Michael Vick should have gone to jail for the whole dog fighting scandal. That does not mean I condone what he did, I just did not see it as offensive enough to warrant jail time. It also does not mean that I lean toward disregard for animals in my own actions. Far from it; our dog is in the midst of allergy season with an accompanying disgusting odor, and yet I feel guilty about making her sleep in the garage. Yes, I can be pretty cruel! I think a lot of Christians may be like me and wind up giving the impression that they have no regard for the welfare of animals, when in reality they are just overreacting to the perceived hypocrisy of groups such as PETA. Truth is, the Bible is clear that none of God's creation should be abused. Which brings us to one of our Pastor's points from his sermon. The whole issue of animal sacrifices as instituted in the Old Testament law was NOT evidence of a lack of compassion for animals, but rather evidence of a huge amount of compassion for sinners. The shedding of the blood of those animals, far from placing a low value on their life, was to show just how utterly life and death serious the matter of sin was! If you go to Hebrews chapter 9, you will read how Jesus' death on the cross was the fulfilment of the sacrifice for sins pictured in the Old Testament. That is how serious sin is! Why would a 64 year old Grandfather build and ride a Blown NitroTop Fuel Bike? Some times I ask my self that same question. I have been drag racing for 30 + yrs, mostly Pro Gas. Top fuel I was afraid to try it was too dangerous, Ha Ha. Dec.20 2006 I was diagnosed with Met static renal cell carcinoma - kidney cancer! It had spread to the pancreas, kidneys, adrenal glands, thyroid, lymph nodes and lungs. My wife Pam and I were stunned beyond belief. All we could do was hug each other and cry Pam being a critical care nurse new I was dealt a death sentence. After we hugged a long time she asked me is there any thing you would like to do or see before you die. I didn’t hesitate and said, I would like to go 200 miles per hour on a Top Fuel Bike. Then we cried together. Feb 23 I had a total nephrectomy of the right renal bed. A soft ball size cancer was removed, along with My right kidney and adrenal gland, because the mass was cutting off the blood supply to my heart. The doctors sent me home and told me I had 6 months to 1 year left on this earth. They told me there was no cure for stage 4 renal cancer, and it grows fast!. At that point I thought It was the end of the line. I wept and give myself to Jesus. I asked for forgiveness of all my sins against God and Man, I asked the Lord to use me to do His will until the day I would leave this world. That fall I was still here and my father in heaven sent me to a little Pentecostal church in Pen valley Ca. Then the Lord blessed me with musical talent I never new I had so I wound up on the worship team singing, playing harmonica, guitar, banjo and writing songs To the lord. Pam and I went to a Harley race in Sacramento. While there we purchased a used Top Fuel chasses built by of all things hell racing. We started building the Blown Fuel Bike I thanked the lord for every day and the strength to go on. The Lord blessed me with the time and the talent to build this awesome Blown Nitro Harley and we named the bike THE MESSENGER. We finished the Bike November 09, we worked hard trying to get it to go that 200 mph in the ¼ mile. Aug 28 2011 at Woodburn drag strip THE MESSENGER Amazed us all when I rode it to an 1/8 mile time of 4.2 sec at 191 mph and ¼ mile et time of 6.59 Sec. at 181 mph. looking at the data collecting computer showed I had clicked off the throttle at 5.2 sec. and The MESSENGER was going 217 mph. On the return road as the crowd cheered I looked up to heaven with tearing eyes held up my hand to the LORD and thanked Him for blessing me in so many ways. You know he loves us so much, He made us in his own image. He wants to hold you in his arms, He wants to give you strength to make it through what ever trial the world throws at you, He wants to forgive your trespasses, He wants you to be free, He wants you to do your best to sin no more, He wants you to love him with all your heart with all your soul, with all your strength, with all your mind, and love your neighbor as yourself. Luke 10:27. If this Testimony has touched your heart God is reaching out to you, now is the time to take his hand and Say this simple prayer. Father in heaven the time has come I want to know you. I want you to hold me in your arms, show me the way father, I pray for the gift of the Holy Spirit. I ask for your forgiveness for my many trespasses against you and my neighbors. Help me to forgive those that have trespassed against me. Help me to walk in your Son’s footsteps in Jesus Name I pray. Amen. Welcome to god’s family. Every race we run on in this world means nothing unless we honor the Father and the Son in everything we do. I know I’m going to heaven cuz this bike scared all the hell out of me. God bless you and keep you. I would like to just add a couple comments. For you gearheads, did you note that he closed the throttle only 1 second past the half track point and he was already at 217MPH? Any guesses as to how fast the full 1/4 mile would have been? Wow! And for those of you who are not yet Christians, note that Bob's number one priority became proclaiming the good news of Jesus Christ. I can only speculate that it is part of God's plan to get someone's attention by means of the performance of "The Messenger". Someone who perhaps would have never heard of Bob Grimes or his testimony of salvation without this bike. 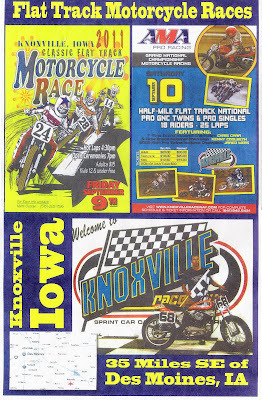 Tonight (Friday Sept 9th) vintage flat track bikes will take to the Knoxville half-mile for some exciting dirt track action bringing back memories of past glory. 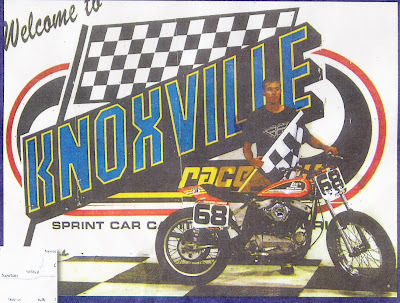 Josh Koch's win there last year resulted in this year's poster featuring him along with the Bill Hofmeister owned Iron XL which he rode to victory (with porting work by yours truly). On Saturday the AMA Pro Flat Trackers will follow suit and battle it out for current bragging rights. If you are in the area, you won't regret taking time to attend!